Yield chasers do crazy things. Especially in the yield-starved environment we’re in today. Despite the incredibly risky nature of Argentine debt, last year the nation issued bonds with a 100-year term. And because of the “chase for yield,” investors bought them. Argentina has spent more than 75 years in default. More recently, as we mentioned, the country defaulted in 2001, then made it to 2014 before defaulting again. And yet, it was able to issue bonds with a promise to pay back investors in 2117. These bonds made no sense… The long duration meant the price of the bonds would fluctuate drastically with interest rates. And the likelihood that these bonds will pay off in full in 100 years was close to zero. For all that risk, investors would earn a yield of around 8%. Still, the country offered $2.75 billion of debt and attracted $9.75 billion in orders. Shockingly, investors couldn’t get enough. Argentina offered this bond last year. Since then, they’ve dropped to a price of $0.79 on the dollar, with much of that drop coming in the past two months. Collecting a 7% or 8% annual yield doesn’t do much for you when the bonds drop 22% in a year. The fall comes because Argentina had $30 billion in local debt coming due that it couldn’t pay. It had to open an emergency $50 billion line of credit with the International Monetary Fund in June just to stay solvent… And it’s already raised its benchmark interest rate to 40%. This trouble with local debt has driven the Argentine peso down around 36% against the U.S. dollar this year, making it even harder for the country to pay off its dollar-based debts. So after issuing a 100-year bond, Argentina is at risk of defaulting within one year. In my income-focused newsletter, Income Intelligence, we look for reasonable and safe ways to earn income. And, despite the yield-starved market, we’ve done just that. Our Income Portfolio boasts an average yield of 5.6%. And our “yield on cost” – the current dividend divided by the price we paid – is 7.6%. And right now, there’s a realistic chance to double or triple your money in the next year or so – while collecting a massive 6% dividend. Q: My doctor says vitamin D is good for a healthy heart. I exercise a lot and my bones are fine. – R.M. A: Ask your doctor, any time he spouts this sort of nonsense, for the evidence… first in any sort of randomized trial, then ask for a look-back study, a so-called retrospective study, and then ask him for any basic scientific explanation of the results. It doesn’t exist. Fire your doctor, and go get another. Securing income in retirement is crucial to living a comfortable lifestyle. That’s why today, we’re sharing part of a recent issue from Dr. Eifrig’s Income Intelligence monthly newsletter. It’s a picture of the stock market and where it stands on things like debt markets and the constant “chase for yield” investors pursue. 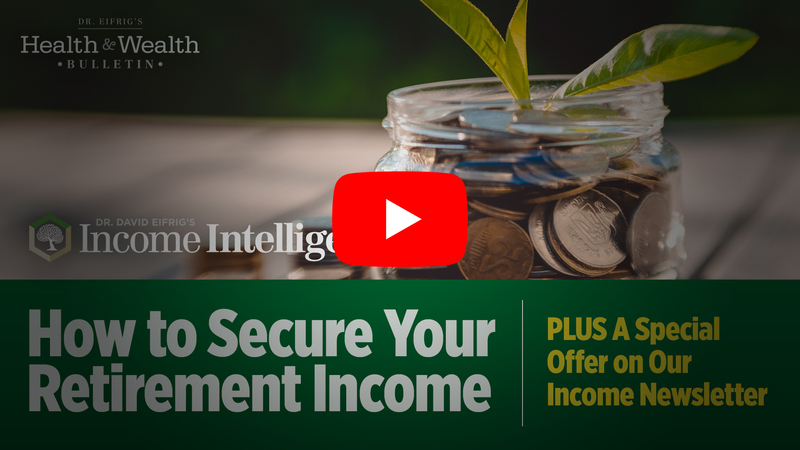 Plus, you won’t want to miss out on our SPECIAL OFFER for a subscription to Income Intelligence. Click below to watch. Q: Minute Maid orange juice that you recommend adds calcium to the juice. What’s the difference between taking a calcium supplement and having a manufacturer add it to a liquid? It’s not naturally occurring in the juice. – D.B. A: Our apologies, D.B. We saw your initial request and the truth is… this is a bit of a hard one for us to answer. The problem is a lack of research. Many calcium-fortified foods like orange juice, cereal, and bread have very little research behind them. We don’t really know if our bodies break down this added calcium as if it were natural or from a supplement. There are a few studies on orange juice, however. And what we found indicates that we absorb the calcium about the same as from regular milk. One study from Nutrition Research showed that we absorb about 35% of the calcium from fat-free milk versus 36% from fortified orange juice. The reason is likely because orange juice uses a form of calcium called calcium citrate malate, which is more easily broken down. What’s more, the citrate in it keeps it from forming kidney stones, unlike other types of added calcium. So this isn’t a license to just eat all the calcium-added foods you can. Keep rounding out your diet with dairy, especially yogurt, as well as fish and leafy greens. Beans, almonds, and seeds (like poppy and chia) are all good sources of calcium, too. Q: Enjoyed [The Living Cure]. Know of someone who could really use the info asap. How can they go about procuring a copy? – S.S.
A real, science-backed alternative to poisonous chemotherapy and radiation. Where to go if anyone you know is faced with this horrible disease. How to access incredible treatments not available to the general public. One decision that could instantly double your chance of survival. For anyone who doesn’t have a copy, they can get one right here. Keep sending your questions. If you haven’t gotten an answer yet, keep reading each Friday’s Q&A… We may even dedicate a full issue to your topic. Shoot them our way – [email protected]. Inflation just hit a multiyear high… Don’t worry about it. Something different: This is the world’s oldest color.